You are here: Home / Ethnic Groups / The People of Sulawesi / Who are the Luwu? The Luwu live in the province of South Sulawesi. They primarily live near the Kalaena River. A cave named Supang Bita is in the Pangkep regency. It is reputed to be the home of Luwu’s ancestors who lived over 5,000 years ago. On the wall of Sumpang Bita is an old drawing of the palm of a man’s hand, the sole of a man’s foot, a boat, a deer and a wild boar. It is thought that these elements show the former lifestyle of the Luwu people. 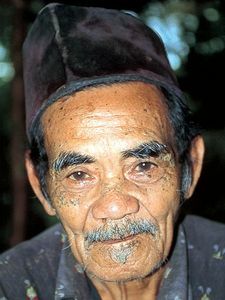 The Luwu are historically considered one people group. The Kingdom of Luwu (also Luwuq or Wareq) is the oldest kingdom in South Sulawesi. Residents living in the former Luwu Kingdom area consider themselves Luwu people. The Luwu generally live as farmers. Besides planting rice, they also grow corn, chili peppers, cassava and potatoes. Coffee and cloves are grown for trading. Some Luwu gather snails, eels and small fish from the irrigated rice fields that are not yet planted. Most farmers use water buffalo to plow their rice fields. The Luwu are well known for their houses and rice barns, which are decorated with complex carvings. Many houses also have large statues of wealthy Luwu nobles. Luwu villages are fairly small and either located on hills or spread along a plain. These villages consist of extended families, with four to six families living together in one house. They stress the importance of diligence, respecting their elders, and putting the needs of the family before the needs of the individual. Luwu parents and older relatives sometimes arrange marriages, but today most young people are given permission to choose a spouse themselves. After marriage, the new couple may choose to live with either the husband’s or the wife’s family. An unusual form of adoption is frequent among the Luwu. They believe that family bonds can be broadened and made stronger by allowing relatives or friends to adopt their children. The children end up being raised by both their original parents and their adoptive parents. In 1605, Luwu’s ruler, La Patiwareq, Daeng Pareqbung became the first South Sulawesi ruler to embrace Islam. Since that time, all the Luwu have followed Sunni Islam. Despite this history, many animistic practices influence their culture. Among the Luwu, burial is an extremely important event. They believe that this ceremony enables the deceased person to leave the world of the living and continue the journey to the hereafter. Their burial ceremony varies in length and complexity, depending on one’s wealth and status. The Luwu need to be introduced to more practical and productive modern farming to replace their traditional methods. They also need training to improve crop production for increased revenue.